The ITU have announced Edmonton, Canada, as the venue for the 2020 ITU World Triathlon Grand Final - meaning that we now have the next four years planned, adding to previous announcements. While it also bid for the event, news from Bermuda indicates that the home of reigning ITU, XTERRA and ITU Cross Triathlon World Champion, Flora Duffy, will also host series events in 2018, 2019 and 2020. The International Triathlon Union (ITU) today named Edmonton as the host city for the ITU World Championships Grand Final in 2020. The event will mark the third time Canada has hosted the World Championships with Edmonton having organised the race in 2001 and 2014. 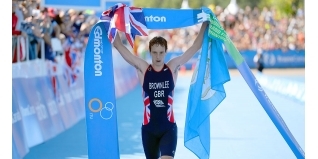 Edmonton was also the site of nine ITU World Cup events, and has hosted a stop on the World Triathlon Series every year since organising the Grand Final two years ago. Last year, Edmonton welcomed paratriathletes for a World Paratriathlon Event, which they will do again in 2017 as host of a stop on the World Paratriathlon Series. In December of 2017, Edmonton will also welcome the final ITU Executive Board meeting of the year alongside the fourth edition of the ITU Science and Triathlon Conference. “Hosting major events is critical to the growth and future success of our sport in every corner of this country. The Grand Final is the premiere ITU triathlon event, so this is a huge victory for Canada, and an exciting day for our sport,” said Triathlon Canada President Les Pereira. “Edmonton has a rich history in staging world-leading triathlon events, and as a result, has ignited the Olympic and Paralympic dream for many of our elite Canadian athletes who have watched the world’s best compete at Hawrelak Park in past years. The ITU Triathlon World Championships were first held in Avignon, France in 1989. In 2009, the championships were revamped, expanding the former single-day World Championship race into an exciting multi-city global series, culminating with the ITU Triathlon World Championship Grand Final. Athletes earn points throughout the season and those who win the overall series are crowned the ITU Triathlon World Champions. The 2017 ITU World Championships will be held at the Grand Final in Rotterdam, followed by Gold Coast in 2018 and Lausanne in 2019. Official dates for the 2020 World Championships will be confirmed and announced as soon as possible.